The end of August always brings me a hope for the end of summer. Not so fast, as if it heard my inner voice, the heat would linger still longer, usually well into mid September. And yet, though I am all for the summer to be over as soon as possible, there are things that I do miss about it: summer vegetables and fruits. At my mother's family in Nagano where I have been staying for this summer, they grow a good few vegetables (fruits, too, but that's for some other time) in their vegetable patches, with plants bursting full of cucumbers, tomatoes, eggplants and corn in the summer. 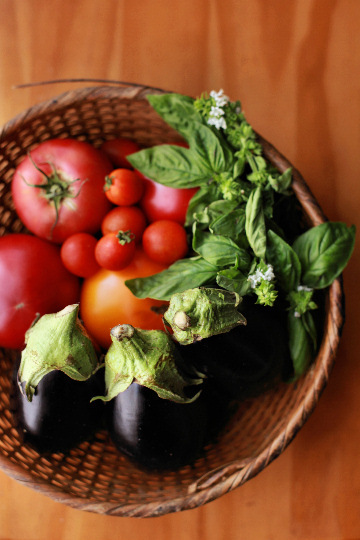 So I have been lucky to be able to enjoy an abundance of extremely fresh vegetables every day. While I can say in a heartbeat that they all taste far fresher and better than most vegetables I'd buy from supermarkets in Tokyo, I must admit there are better things. Far better. My mother and her family know a lot of people who grow vegetables, as most people seem to do so around here in the countryside. And there are this old couple who live on the other side of the mountain from here (don't ask me which mountain - there are too many for me to care to try to identify). They are both really nice people, funny and kind, and they happen to grow the most amazing organic vegetables. He is originally from here, lived and worked for a long time in or near Tokyo with his wife, who is from there. Then they got a house built over here with some land to grow organic rice and vegetables by themselves, not commercially but to feed themselves, and (perhaps more importantly for them) their children and grandchildren. For the first few years, they were visiting from Tokyo, then eventually moved here permanently some ten years ago or so. 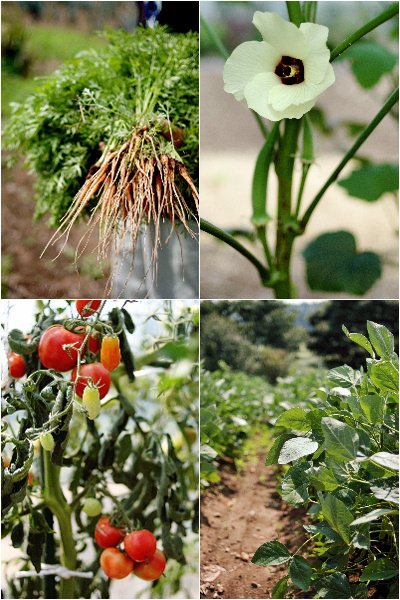 some of vegetables from their patches, clockwise from top left: thinning carrots; okra; soybeans; and cherry tomatoes. photos from september 2008. I first met them back in 2008, while I was staying here. They invited us to their place for lunch. They gave me a quick tour to their vegetables patches, picked a heap of them for lunch, then he treated us to soba noodles that he'd make. 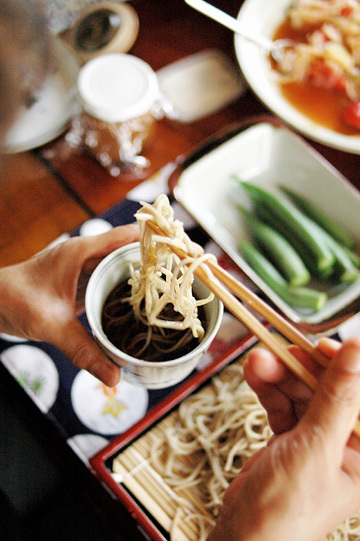 It was my first time to have home-made soba noodles, made from scratch in front of me. He would cook only a single serving at a time and serve immediately to ensure the freshest possible platter of noodles for everyone. And they tasted wonderful - so did all their vegetables that had been cooked into salad, tempura, and so on. Now back to the summer of 2010; a week or two ago, mom visited them and came home with what appeared to be a truckload of vegetables. Eggplants, tomatoes, zucchini, shiso leaves, and an enormous bunch of basil. Everything was fantastic as expected - I never knew some zucchini were so much better than others! -, but the tomatoes were outstanding; both large and small, red and orange. We were excitedly talking about what to make with them, but we ended up eating most of them as is, nicely chilled, maybe with a sprinkle of salt but mostly not. Then a few days later, my mother was out to do some errands, and brought back another case of their tomatoes, this time along with a few slices of homemade tomato bread that they'd baked. The bread was meant to be a small snack for mom to eat on the spot, she explained, but she decided to bring them home so we could all taste it. And I can't thank her enough for that. "She suggested the bread should taste better toasted. And even better with some slices of a fresh tomato", mother said, which we did, along with a few slices of peppered cheese. Because we only had a few halves of a slice, each of our sandwich was bite-sized. But it didn't take more than a bite of it for the damage to be done; after the first bite, mom and I looked at each other, wide-eyed. Gosh, this stuff tastes soooo good! Before even finishing my tiny sandwich, I nagged my mother to ask them for more. My first thought was to ask for the recipe and try and bake it myself, but I was perfectly aware that I am not a great bread baker, and couldn't wait until I become good enough to bake a good bread, if at all. I wanted the bread now! If I could have bought them from the store, I would have. Perhaps moved my enthusiasm (I actually sang a random tune to plead for the tomato bread, and my mother did relay that to them, laughing), or perhaps they were just really nice people, but they ever so kindly accepted our request. And a mere couple of days later, we found ourselves hurrying to their place to receive a freshly baked, whole loaf of tomato bread that was waiting for me us. Soft and slightly chewy, this was simple sandwich bread of a reddish brown shade inside and out, with small freckles of herb all over. 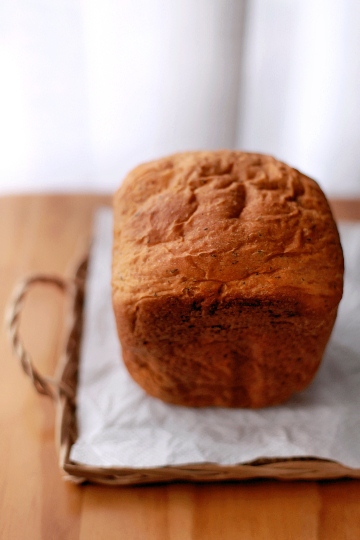 I had had tomato bread before, but many of them would be made with sun-dried tomatoes; with this one, the flavor of tomatoes was a lot fresher, but just as concentrated as that with dried tomatoes. At their house, we hanged around a bit for a little chat (and some other home-made treats). We talked about their bread, and the lady said she merely uses a recipe from the booklet that came with her bread machine, substituting tomato puree for the milk and adding some skim milk instead. So there was nothing particularly special about the recipe itself, it seemed. Then again, the bread was nothing but special. For one thing, she makes her tomato puree (100% tomatoes, no salt added) from their own organic tomatoes, which by themselves taste fantastic. 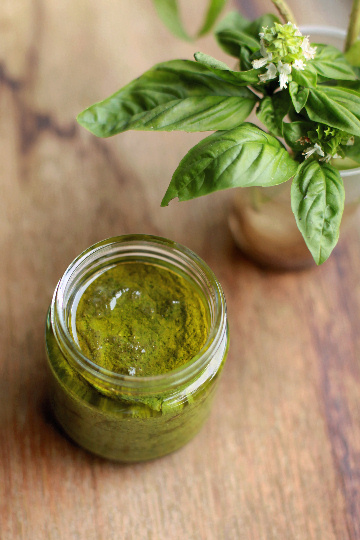 She also adds a bit of dried basil, also home-made. And there's the flour. Turned out, they grow their own wheat (! ), a few different varieties, all organic, and have it milled by a local miller. 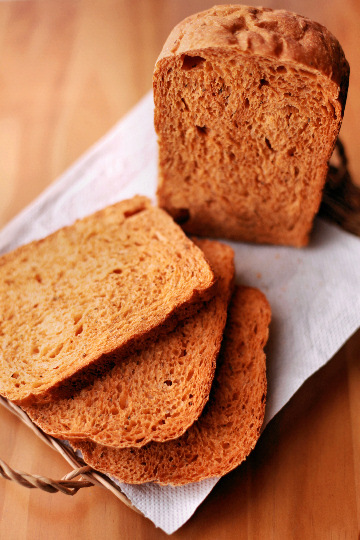 Now how many of us can bake bread using the flour from your own wheat? Around here, it's not uncommon for folks to grow their own rice, but growing wheat for personal consumption would be a lot less common. Then again, they are the type of folks who grow soybeans and make their own miso, so I wasn't too surprised to hear this, though still deeply impressed all the same. Along with the beautiful loaf of tomato bread, they sent us home with another case of fresh tomatoes as well as a bunch of other stuff. 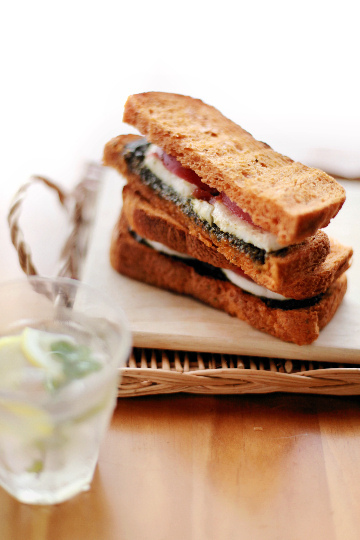 And I knew exactly how I wanted to eat the bread; tomato sandwich again, but a bit revved-up version of it. I wanted to keep things simple so the flavors of the tomatoes - both the fresh tomatoes and the tomato bread - would shine through, but couldn't help but thinking of a jar of basil pesto I had made a few days earlier. In fact, it was made from the bunch of basil from the same people, so it seemed only fitting to use them together. Err, I went a little too generous with pesto! But despite that something like this could hardly go wrong. 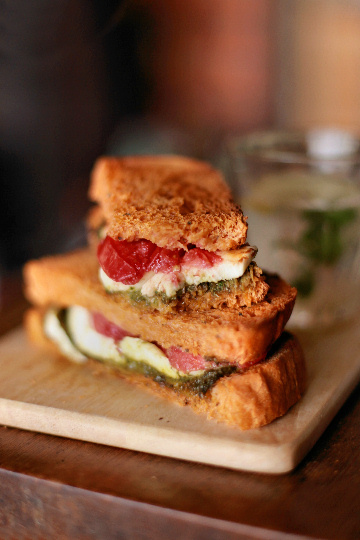 It was easily one of the simplest and tastiest sandwiches I had ever made and ate, not because of my skills or ingenuity but thanks entirely to some of the best possible ingredients I could ever hope for. The loaf has disappeared all too quickly and I have shamelessly requested them for another, hopefully sometime soon. We still have a few of their fresh tomatoes left, but they said those were their last tomatoes of the season ("this has been a really short season! ", they sighed), so we may not get to make this sandwich again - at least not this year. The end of the tomato season means that the end of the summer (right? ), so I can't be happier about it. 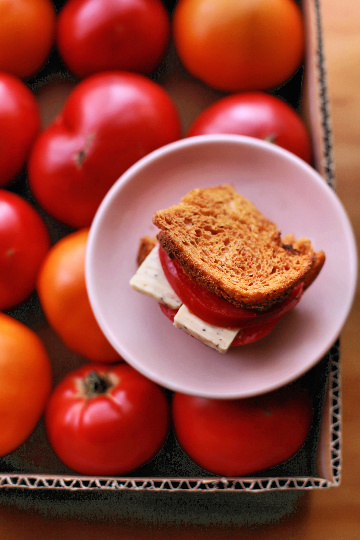 But if the summer means these gorgeous tomatoes and this phenomenal double-tomato sandwich, it may perhaps be worth looking forward to, even for a summer hater like myself who have always dreaded the summer heat. After all, I know that you can never have good tomatoes without the proper summer sun and heat. They need them. We need them. Just remind me of it when I moan and groan about it next year. What kind and talented neighbors. The bread looks incredible! i'm soo drooling over here. I love both your Japanese and English blogs. The bread looks really yummy! 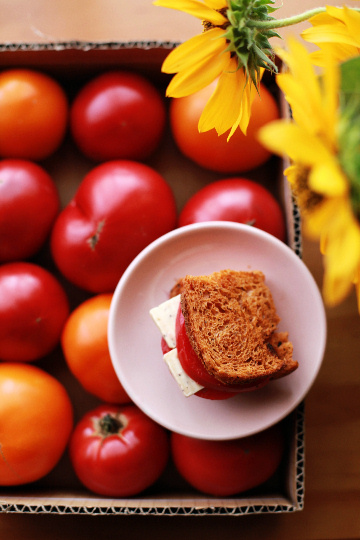 Gorgeous post, I really envy you the tomato bread (and the generous neighbours!). The second-to-last photo is absolutely stunning, too. Great post.... your neighbors sound like really inspiring people! I love reading your posts and looking at your pictures- they are so beautiful, you have an amazing talent!!!! 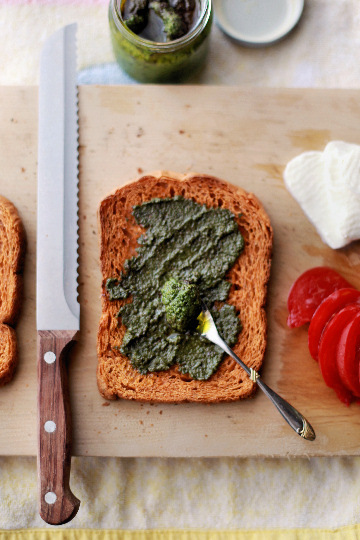 What a lovely post, you've made me want to transform my tomatoes into a loaf too! Gorgeous pics - I love the shot of Mr O (?) eating soba. tabehodai - hahaha i didn't. from what i saw it was just an ordinary bread maker! I really really really want to eat that tomato bread! SO much!